If it is not too late, perhaps it is worth reading excerpts on this issue from two unlikely sources: a senator and an undertaker. MR. RUSSERT: Senator Lieberman, your Republican colleague from Connecticut in the House, Christopher Shays, had this to say. "This Republican Party of Lincoln has become a party of theocracy. . . . There are going to be repercussions from this vote [on Schiavo's constitutional rights]. There are a number of people who feel that the government is getting involved in their personal lives in a way that scares them." SEN. JOSEPH LIEBERMAN, (D-CT): I don't. But that's a very credible and respectable opinion for Chris to take. See, I think -- and Chris was there on the floor of the House, so maybe he heard in the debate some things that I didn't hear following it from a distance. The fact is that, though I know a lot of people's attitude toward the Schiavo case and other matters is affected by their faith and their sense of what religion tells them about morality, ultimately as members of Congress, as judges, as members of the Florida state Legislature, this is a matter of law. And the law exists to express our values. I have been saying this in speeches to students about why getting involved in government is so important, I always say the law is where we define the beginning of life and the end of life, and that's exactly what was going on here. And I think as a matter of law, if you go -- particularly to the 14th Amendment, can't be denied due process, have your life or liberty taken without due process of law, that though the Congress' involvement here was awkward, unconventional, it was justified to give this woman, more than her parents or husband, the opportunity for one more chance before her life was terminated by an act which was sanctioned by a court, by the state. These are very difficult decisions, but -- of course, if you ask me what I would do if I was the Florida Legislature or any state legislature, I'd say that if somebody doesn't have a living will and the next of kin disagree on whether the person should be kept alive or that is whether food and water should be taken away and her life ended that really the benefit of the doubt ought to be given to life. And the family member who wants to sustain her life ought to have that right because the judge really doesn't know, though he heard the facts, one judge, what Terri Schiavo wanted. He made a best guess based on the evidence before him. That's not enough when you're talking about aggressively removing food and water to end someone's life. MR. RUSSERT: You would have kept the tube in? SEN. LIEBERMAN: I would have kept the tube in. Maybe we should all assume, in the sad theater of Ms. Schiavo’s case, something like a default position. We could start by admitting first our failures, our faulty visions. . . .
And maybe, disabused of every notion of control or rancor, righteousness and triumph, cause du jour, certainty, or truth, we could return to the original condition where we are all helpless fellow-pilgrims in search of the way home, praying that the cup passes, or the angel of death passes our people over today, or the paschal mysteries leave our tombs all empty in the end. . . . If there is a God, I am not it: This seems an agreeable article of faith. Whether we know or doubt, wish or wonder; whether we are certain and saved or simply waiting to see, we can agree to keep the difficult vigils of humanity, to be present to the suffering and dying, the dead and heartbroken, to bear witness to life and bear the dying and dead to the edge of a life. Anne Lamott’s "Plan B: Further Thoughts on Faith" is a follow-up to her 1999 volume, "Traveling Mercies: Thoughts on Faith" -- a book I liked a lot. On my forty-ninth birthday, I decided that all of life was hopeless, and I would eat myself to death. These are desert days. Better to go out by our own hands than to endure slow death by scolding at the hands of the Bush administration. Yes, well. Later in the book, she asks God for "help in coping with George W. Bush." Later still, she seeks the strength to "really forgive" Bush, even though he is "a dangerous member of the family, like a Klansman, or Osama bin Laden." Near the end of the book, when she discloses she was "so angry with and afraid of the right wing in this country that it was making me mentally ill," you begin to believe her. Six pages from the end, she fails once again in her "ludicrous" attempt to "believe in George Bush." Lamott can be gracious and funny, sometimes simultaneously, but this book will excite only those who think the above quotes are zingers. It is ultimately a disappointing chronicle of the (apparently limited) efficacy of prayer to ameliorate Bush Derangement Syndrome. Norman Podhoretz went to Israel last month as part of a small group associated with the Hudson Institute to receive a series of briefings on the state of affairs in Israel. He has written an extraordinary article for the April issue of Commentary on the briefings. Things began to change only in 2001, when Sharon, deciding that enough was enough, refused to have anything further to do with Arafat, and finally penned him up in his compound in Ramallah. At first Bush had permitted himself to be influenced by the State Department’s kneejerk disapproval of this move. But then the Israelis intercepted the Karine A, a ship trying -- in violation of a cease-fire which had been brokered by an American envoy -- to smuggle arms into the hands of the Palestinians. Questioned over the phone by Bush, Arafat claimed that he knew nothing about any such ship, and accused Israel of trumping up the incident as an excuse to break the cease-fire. This was exactly the kind of con game Arafat had been playing with perfect success ever since assuming his new persona as a pursuer of peace. But like practically everyone else in the world, Arafat had "misunderestimated" George W. Bush. Not only did Bush refuse the sucker bait, but -- aware of the overwhelming evidence proving that the Karine A had been a PA operation from start to finish, and disgusted by being told so blatant a lie in a one-on-one conversation -- he now joined Sharon in refusing to have anything to do with Arafat. It was the isolation of Arafat, combined with the launching of Sharon’s new strategy and the green light Bush gave to it, that turned the tide against the second intifada. Compare Bush’s reaction to Arafat with that of Bill Clinton -- who as late as June of last year was telling Israel it would have to deal with Arafat if it wanted peace. Podhoretz’s review of Bush’s performance is an important part of his article, and a critical part of Podhoretz’s ultimate conclusions about the future. This is essential reading. (Hat tip: RealClearPolitics). International donors met in Khartoum on Sunday to share impressions they had gathered during the previous week, when seven teams representing donor countries fanned out across Sudan to see the complex situation on the ground. Manuel Aranda da Silva, the Secretary-General’s Deputy Special Representative for Sudan, said that donors could now return to their headquarters fully apprised of the multiple challenges that Sudan faces. The donor teams reported that, although the humanitarian situation has stabilized in Darfur, it is precarious, and violations of protection continue at an unacceptable rate. Having "fanned out," they can report that the "humanitarian situation" has "stabilized" -- except it is "precarious" since "violations of protection" have not stopped. On the contrary, they "continue" at an "unacceptable" rate. Everything’s stabilized. It’s just that people keep getting raped and murdered. Jan Egeland, the U.N. humanitarian coordinator, who just visited Darfur and other parts of Sudan, said it was impossible to estimate the number of deaths from killings or disease because "it is where we are not that there are attacks." . . .
"If you move beyond the camps, the killing continues," Egeland said. "Women are systematically abused and raped. "I told the government at the highest levels that there was a situation totally out of control and is not being stopped," he said. . . . Asked about a U.S.-drafted U.N. Security Council resolution on Sudan, Egeland said he was in favor of imposing sanctions on perpetrators of atrocities because "people are getting away with mass murder." Egeland’s reference to "people" committing "mass murder" sounds bold, but is in fact the bureaucratic language necessary to avoid placing the blame on a "government" committing "genocide." People committing mass murder might require a few trials of individuals at The Hague in the future (by the way, how’s that Milosovic trial going these days?). A government committing genocide would require the UN under its charter to act -- now. But Egeland has told that Sudanese government -- in what he apparently thinks is news to them -- that the situation is totally out of control and not being stopped. C-SPAN had planned to televise a speech at Harvard by Emory University Holocaust scholar Deborah Lipstadt, whose new book, "History on Trial," recounts her legal victory over Holocaust denier David Irving, who sued her for libel in Britain over material in her 1993 book "Denying the Holocaust." But then Lipstadt was informed by the sages at C-SPAN that, in the interest of "balance," they'd also be airing an appearance by someone on the other side of the argument -- who, it turned out, was none other than David Irving. Lipstadt refused to go along with this exercise in non-judgmentalism, and, for now at least, it appears that her Harvard speech won’t be seen on C-SPAN. In the end, Lipstadt had to choose between promoting her own book -- a terrific read, by the way -- and giving Irving the audience of his dreams and a status equal to her own. C-SPAN said it was only seeking fairness, but it was asking Lipstadt to balance truth with a lie or history with fiction. "Unwilling to accept my no as final, she vigorously condemned Holocaust denial and all it represented. Then, in one last attempt to get me to change my mind, she asked me a question: 'I certainly don’t agree with them, but don’t you think our viewers should hear the other side?'" "The producer was incredulous. She found it hard to believe that I was turning down an opportunity to appear on her nationally syndicated televised show. . . . "I explained repeatedly that I would not participate in a debate with a Holocaust denier. The existence was not a matter of debate. I would analyze and illustrate who they were and what they tried to do, but I would not appear with them. LGF’s thread on C-SPAN’s action ("appalling -- six million times over") -- is here. UPDATE: Edmund Fawcett, former literary editor for the Economist, has an excellent review of Lipstadt's book. Five public apologies, repeated statements he would do better, numerous assurances he had learned a lot, public acknowledgment he hadn’t known what he was talking about, appointment of two (two!) committees to increase the representation of women on the faculty (and pronto), two "searing" public grievance sessions with the faculty, multiple private meetings with small groups of faculty members to hear their complaints privately, and more. Result: the Harvard Faculty of Arts and Sciences (FAS) passed a motion of "no confidence" in President Lawrence Summers by a vote of 218-185 (with 18 abstentions). I suggest we pause for a moment to imagine how these proceedings will be judged by our successors a generation hence, in hopes that we can learn from the mistakes we have already made and perhaps avoid worse ones. If there are any China historians still around, they might recognize, in our session of last Tuesday [February 15], an old-fashioned Chinese struggle-session. In the 1960s, the designated target (let's call him Mr. Liu) would be set upon by his colleagues (soon to be his former colleagues), his back already against the wall because of an injudicious remark or a deviation of policy, or simply because he was on the wrong side of a factional divide. Mr. Liu would then be assailed retrospectively for every flaw of omission or of commission, every quirk of personality or unsatisfactory class standpoint. Everyone felt compelled either to join in the assault or to remain silent, to avoid being next on the list of targets. Mr. Liu would then be expelled from his job, or much worse. Those were ugly spectacles. Chinese had -- and still have -- no channel to confront their leaders through legitimate procedures. But we have question periods at every FAS meeting. This question period (which I gather we're still in) is one of the very few to have provoked anything but deafening silence. Has nobody felt the urgency to question the policies of the administration and their appointed committees? Is there no gripping issue begging for discussion? . . . .
And where is this so-called "fear and intimidation" coming from? Can anyone on earth have less to fear than a tenured Harvard professor? Shouldn't tenure impose an obligation to speak out plainly and often? Our successors will hold us in contempt -- unless, heaven forbid, they're just like us. We won’t have to wait for the successors. Like the Chinese and Soviet proceedings, the Harvard faculty’s action will be remembered more for what it demonstrated about the judges than about the judged. It may also be remembered for some of the eloquent statements by faculty members in the minority (including professors Ruth Wisse, Philip Kuhn, Douglas Melton and Lawrence Katz, recorded here and here). And it is encouraging that the Harvard students (with certain exceptions) seem to have kept their senses. Ward Churchill is a single professor at a state university saying transparently stupid things. What do you do when the faculty at the nation's oldest and most prestigious college stages a show trial? UPDATE: Add the name of Lubos Motl, assistant professor of physics at Harvard, to the honor list. He posted "A Sad Day for Harvard" last night on his blog. Worth reading. Harvard Magazine, which has provided exemplary coverage of this sad affair, has published a lengthy summary of the remarks of each speaker at the "remarkable meeting held on the Ides of March:"
[P]rofessor of history Stephan Thernstrom . . . said the issue before the faculty was a paramount principle of academic freedom. . . . Controversial ideas and free debate, he said, were the essence of universities, and of the institution of tenure. In the 1950s, "the enemy was out there. It is deeply depressing to me that today the enemy is within." . . .
[P]rofessor of psychology Steven Pinker . . . [said] Summers had given a talk on women in the sciences, and his content dealt with a controversial, empirical issue -- not a matter subject to a vote on its correctness. . . .
Voting in favor of the resolution could only be seen, then, as declaring that the University wanted its president to hew to dogma, in line with majority sentiment. Professor Thernstrom also criticized "the president’s 'abject' apologies for what he had said, when he would better have defended his remarks." As would have Mr. Liu. Sixty years after the liberation of Auschwitz and the end of World War II, Yad Vashem will inaugurate its new Holocaust Museum in Jerusalem this evening. The state-of-the-art $56 million complex, which aims to keep the memory of the Holocaust alive in the 21st century . . . will be officially inaugurated with a solemn ceremony which will be attended by dozens of world dignitaries, including 15 heads of state and government, UN Secretary-General Kofi Annan, New York City Mayor Michael Bloomberg and Nobel Prize laureate and Holocaust survivor Elie Wiesel. . . . The new museum, designed by internationally renowned Israeli-American architect Moshe Safdie, is a 4,200-square-meter prism-like structure that slices through the Jerusalem hilltop known as the Mount of Remembrance. . . . The mostly underground structure, topped by a skylight, cuts through Mount Herzl, almost completely blocking out the light of the Jerusalem sun, except for a dim ray, visible all along the length of the building. Only at the museum's exit is the sun allowed to shine in at full force. Visitors who enter the museum are forced by its design to zigzag through a series of historical galleries in strict order, with each depicting another stage in the destruction of European Jewry. . . . Throughout the museum, 100 screens show short films with the testimony of 60 survivors. Other displays include the original Auschwitz Album and Schindler's lists along with hundreds of haunting pictures that line the walls. 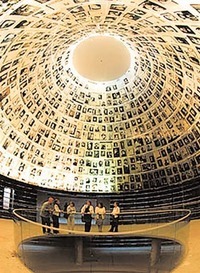 The museum ends with the new Hall of Names, where the names of the 3 million known Jewish victims are stored, with visitors asked to add additional names at Yad Vashem's recently inaugurated computer database system. In the middle of the room is a pit which cuts deep into the bedrock, terminating with a pool of water which reflects the faces affixed to the dome above. The abyss represents the 3 million Jewish victims whose names remain unknown. The exit emerges dramatically out of the mountainside, the light suddenly once again in full force, affording a panoramic view of Jerusalem. Haaretz has a story about the "Long Road to the New Museum" that highlights the influence of the United States and the Jewish Diaspora on the expanded museum in Israel. Worth reading in its entirety. Listen to the conversations in the cafes on the edge of the creek that runs through this Persian Gulf city, and it is hard to believe that the George W. Bush being praised by Arab diners is the same George W. Bush who has been widely excoriated in these parts ever since he took office. Yet the balmy breeze blowing along the creek carries murmurs of approval for the devoutly Christian U.S. president, whose persistent calls for democracy in the Middle East are looking less like preaching and more like timely encouragement. Nowadays, intellectuals, businessmen and working-class people alike can be caught lauding Bush's hard-edged posture on democracy and cheering his handling of Arab rulers who are U.S. allies. . . . [I]t is not quite a lovefest but a celebration nonetheless. "His talk about democracy is good," an Egyptian-born woman was telling companions at the Fatafeet (or "Crumbs") restaurant the other night, exuberant enough for her voice to carry to neighboring tables. "He keeps hitting this nail. That's good, by God, isn't it?" At another table, a Lebanese man was waxing enthusiastic over Bush's blunt and irreverent manner toward Arab autocrats. "It is good to light a fire under their feet," he said. [T]here is a keen sense of irony that a passionately Christian American president who has supported Israel, invaded an Arab country and presided over an occupation marred by violence might actually make a positive difference in the Muslim world. It has people here citing the Koranic verse that speaks of a catastrophe that bears good fruits. Perhaps it will be remembered as a "catastrophic success." A couple of years back, I went to hear Paul Wolfowitz. I knew him only by reputation -- the most sinister of all the neocons, the big bad Wolfowitz, the man whose name started with a scary animal and ended Jewishly. In fact, he was a very soft-spoken chap, who compared the challenges of the Middle East with America’s experiments in democracy-spreading after the second world war. He said he thought it would take less time than Japan, and maybe something closer to the 1989 revolutions in Eastern Europe. I would have scoffed, but he knew so many Iraqis by name -- not just Ahmed Chalabi, but a ton of others. Around the same time, I bumped into Dominique de Villepin, the French foreign minister and man of letters. He was just back from Egypt, where he’d been profoundly moved when he’d been asked to convey the gratitude of the Arab people to President Chirac for working so tirelessly to prevent a tragic war between Christianity and Islam. You don’t say, I said. And, just as a matter of interest, who asked you to convey that? He hemmed and hawed and eventually said it was President Mubarak. Being a polite sort, I rolled my eyes only metaphorically, but decided as a long-term proposition I’d bet Wolfowitz’s address book of real people against Villepin’s hotline to over-the-hill dictators. The lesson of these last weeks is that it turns out Washington’s Zionists know the Arab people a lot better than Europe’s Arabists. Australian blogger Arthur Chrenkroff has another remarkable roundup of the past two weeks' good news from Iraq. Worth reading in its entirety (and it will take a while). The paperback version of "I am Jewish: Personal Reflections Inspired by the Last Words of Daniel Pearl" is out. There are some essays in it that are worth the price of the book alone. (All royalties benefit the Daniel Pearl Foundation). Some of the best essays are by Ruth Wisse, Lawrence Summers, Natan Sharansky, Cynthia Ozick, and Martin Peretz. There are more than 100 others (a list of the contributors is here). [T]he facticity of my identity, the accidental truth that it is what I have inherited, rather embarrasses me. I wish I could have chosen it. I pray that I would have chosen it. Accident is not an adequate foundation for a life. I envy converts, once the sons and daughters of their parents and now the sons and daughters of Abraham and Sarah. They are Jews as a consequence of their own reflection and their own freedom. 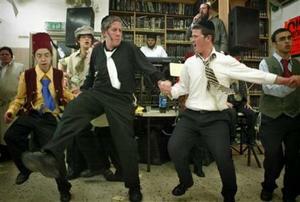 They became Jews out of inner necessity. But I must transform outer necessity into inner necessity. It is an important book -- a collective picture of the Jewish people, written by professors, politicians, journalists, authors, rabbis, actors, entertainers, and young people. Out of a barbaric act, a lasting, living memorial -- and more.